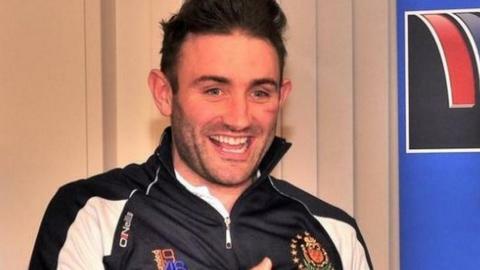 Whitehaven have signed British Amateur Rugby League Association international John Paul Brocklebank for 2015. The 24-year-old loose forward or stand-off previously played for Egremont Rangers and scored a try for Cumbria against England in 2010. He joins former Kells centre Connor Holliday at the Recreation Ground. "In 28 years of professional coaching, this is the biggest amateur signing I've ever been associated with," coach Steve Deakin told BBC Radio Cumbria. "Steve Nicholson started the momentum in persuading Brocklebank to come here before I joined." Brocklebank (top centre) crossed for Cumbria in the Garry Purdham memorial game against England in October 2010. Brocklebank helped Egremont to the Division One National Conference title in 2012, winning the Player of the Year award. "It's been a long time coming and now its the time to do it," Brocklebank said of his switch to professional rugby league. "I have a young family now, so no more BARLA tours any more."